This space provides an enjoyable, relaxing environment in the bustling urban corridor. Lawn and gardens surround an inner plaza where there are colorful tables with umbrellas as well as uniquely designed seating for people to enjoy the outdoors. More active park users can play a variety of outdoor games (including bocce) in the multiuse recreation area. 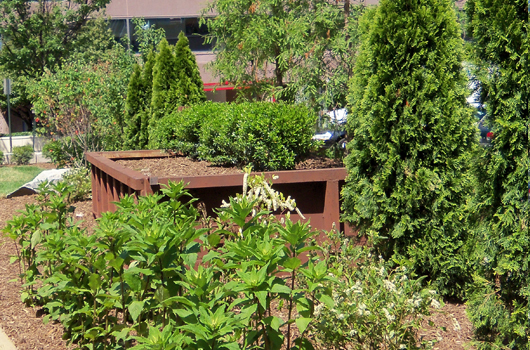 An existing garbage dumpster was reclaimed from another site and is used in the park as a planter for native plant species. Boulders on the site were reclaimed from other spaces in Arlington, and will be reused after the life of the interim space is over. The majority of the plants, mulch and soil were retrieved from existing County inventories. Furniture elements were selected for their potential reuse on other sites at a later date. Other low-cost elements include the use of porous crushed stone paving material and simple concrete blocks for planters. 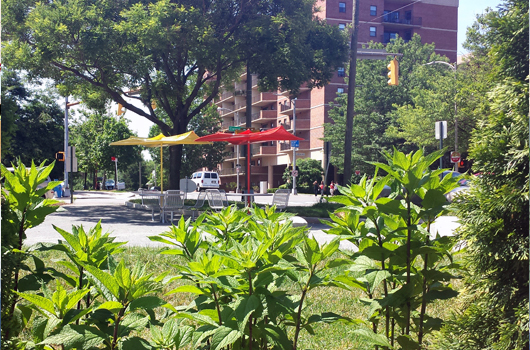 Bean, Kinney & Korman has adopted the Clarendon-Barton Interim Open Space. 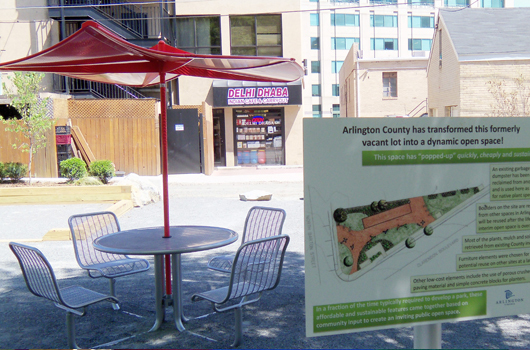 Find out how you can adopt an area in Arlington County.